For the complete warrior who wants nothing short of total protection, there is the Conquerors Armor set. 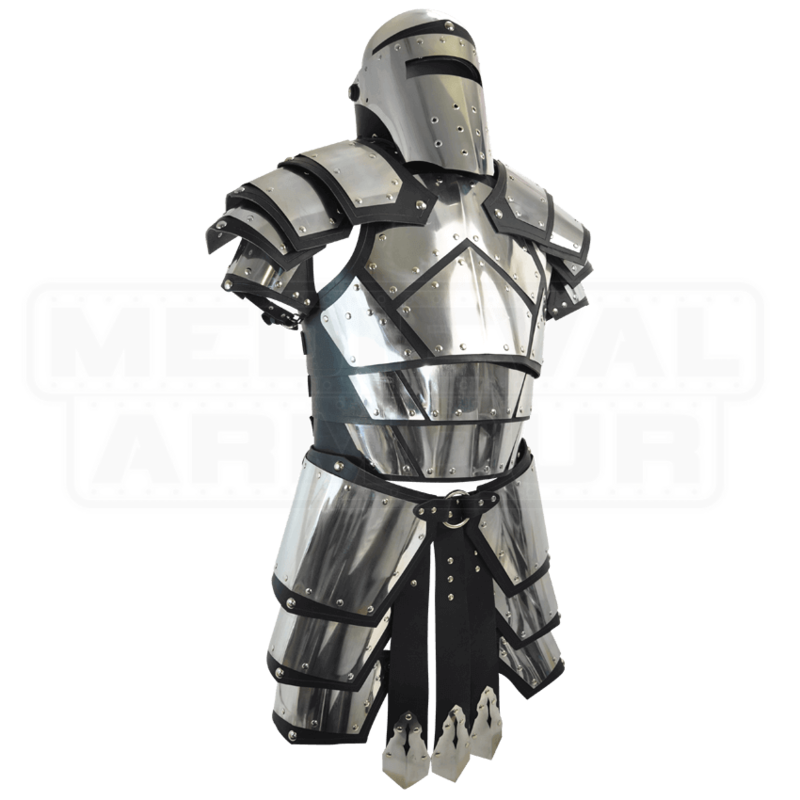 This armor is highly protective, covering the chest, shoulders, and upper legs in layers of leather and metal. This armor consists of a black leather breastplate that is composed of three leather bands, as well as a matching back plate that is connected to the front via shoulder straps. This armor also features several polished metal plates that are riveted in place, creating a series of plates that enhance the protection it offers. These plates are 20 gauge stainless steel, while the leather armor 9-10 oz. leather. 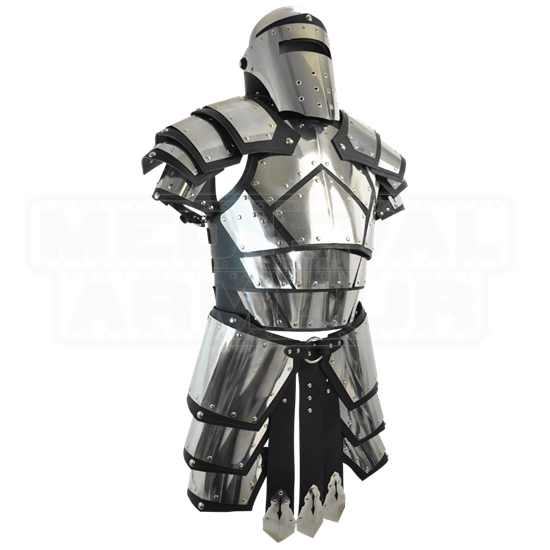 The Conquerors Armor comes complete with matching shoulder pauldrons and a tasset belt! The pauldrons are similar in construction to the breastplate, consisting of four lames of leather plated with stainless steel. Each pauldron ties onto the shoulders of the breastplate, while also featuring an adjustable leather strap and buckle that secures the bottom of the pauldron to the arm. The included tasset belt consists of an adjustable leather belt that supports several leather lames plated with stainless steel. When worn, the leather lames hang over the upper thighs and legs, providing superb protection. Please note, however, that the Conquerors Armor only includes the breastplate, the pauldrons, and the tasset, as described above. The helmet and other accessories are not included. Each size is secured with three buckles and straps on the side that wrap around the back, providing an adjustable fit. Because each size is adjustable, it is best to order your armor in the size that closest matches your measurements, and then adjust to personal comfort when you wear your armor. With this Conquerors Armor on, you will be almost fully protected for all manner of attacks, although a good pair of greaves and bracers will also go a long way to completing the look and the fortifying your protections.